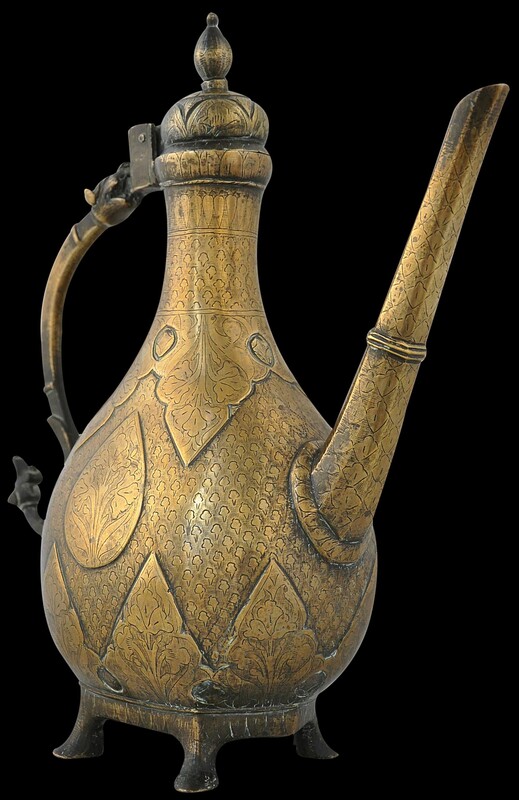 This northern Indian ewer is of typical form. The tear-shaped body stands solidly on four small feet, and the neck tapers and then widens to a lidded mouth. 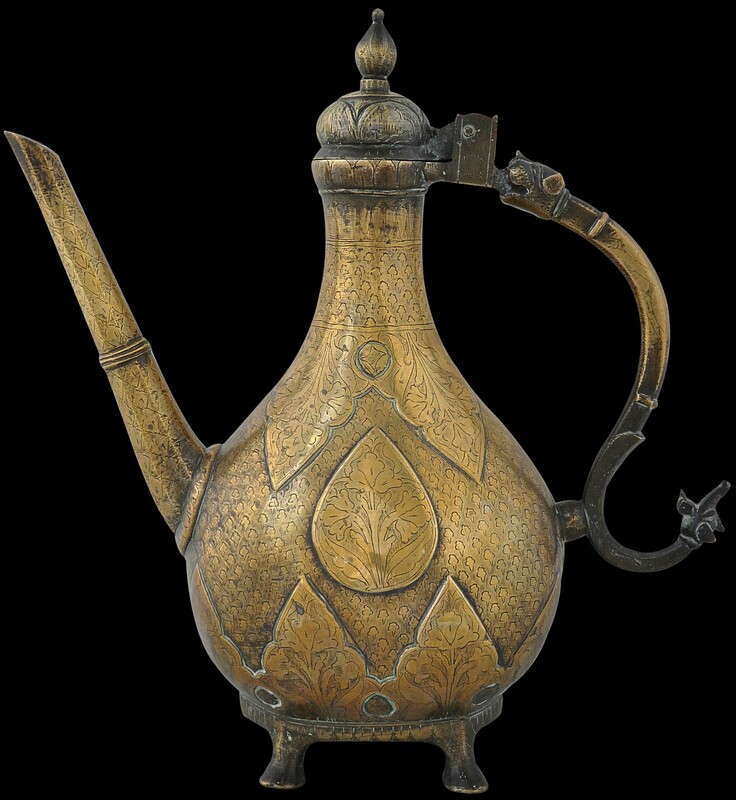 But several details mark this ewer out as a better quality example. It is larger than most similar examples, and of a good weight. The spout is strong and lightly faceted. The design work on the body is of better quality than usually encountered. And the ‘S’-shaped handle has been cast with elaborate and carefully rendered tiger and makara heads at either end. The lower finial especially more typically ends in a simple bud-like finial but here there is a dramatic long-snouted makara with a gaping mouth. The body, lid and spout has been engraved all over with repeated stylised poppy motifs. The domed lid has an architectural quality not unlike the Mughal domes of northern India. It is cast with additional geometric design and is surmounted by a bud-like finial. 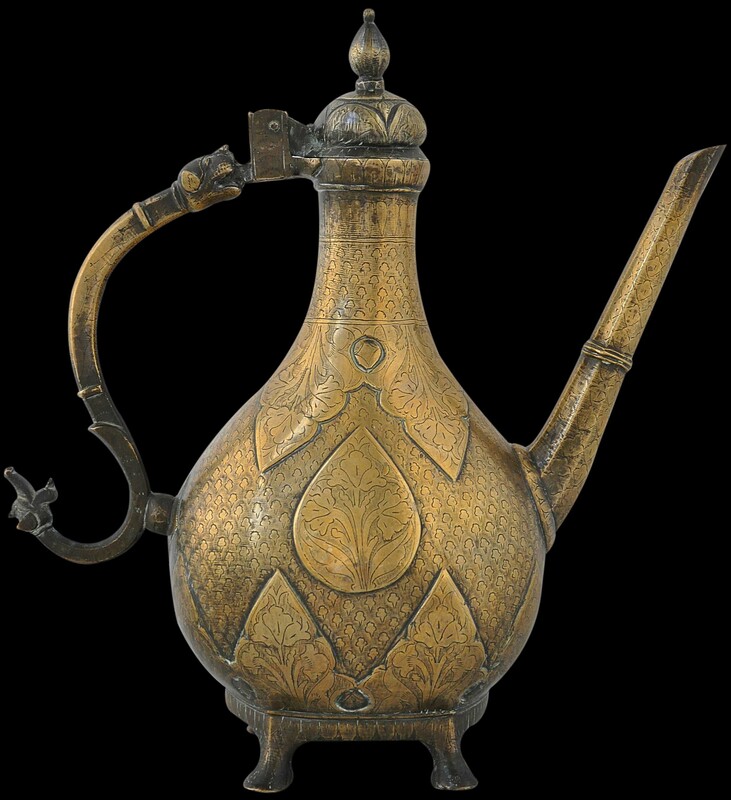 The ewer is heavy in the hand, has a good patina and is free of any dents, repairs of holes. Overall, the condition as with the form, is excellent. Zebrowski, M., Gold, Silver & Bronze from Mughal India, Alexandria Press, 1997. Dye, J.M., The Arts of India: Virginia Museum of Fine Arts, Philip Wilson Publishers, 2001.